A relationship in shambles, a spunky innkeeper with a dark past, and thousands of eyes watching—Annie Baker’s John brings audiences face-to-face with the unsettling and the uncomfortable. Directed by Jonathan Goad for the Company Theatre, and performed at the Berkeley Street Theatre Upstairs in Toronto, John presents a series of complex and jarring events that quickly go from bad to worse for Brooklyn couple Elias Schreiber-Hoffman (Philip Riccio) and Jenny Chung (Loretta Yu). In an attempt to salvage what remains of their relationship, the young couple arrive at a bed and breakfast in present-day Gettysburg, Pennsylvania for a romantic getaway. 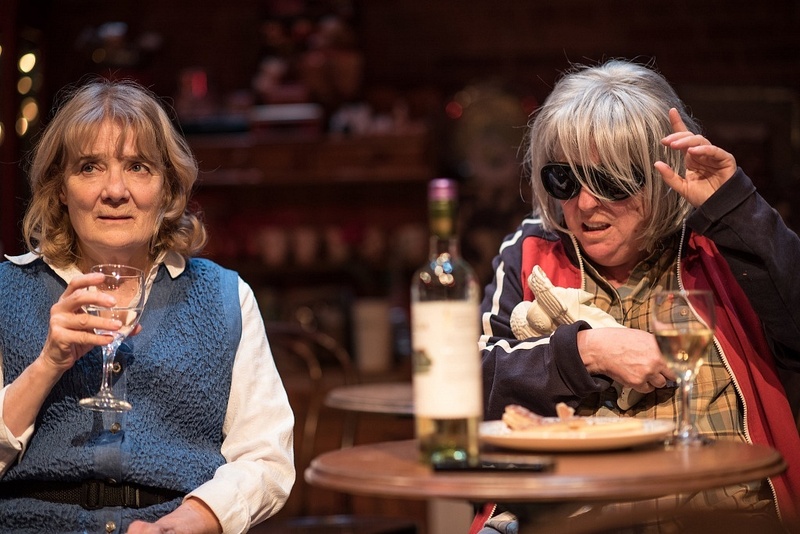 Mertis Katherine Graven (Nancy Beatty), the cheery owner of this humble establishment, provides light-hearted comedic relief when the tension between the two feels too much to bear. There is just one problem: Mertis owns an unnerving number of dolls, stuffed animals, and figurines whose penetrating gazes seem to be judging all that unfolds. Mertis’s outspoken friend Genevieve Marduk (Nora McLellan), like the figurines, is a permanent fixture in her life, the two sharing a bond that reaches beyond friendship—one of comfort and necessity. Yu and Riccio in John. Photos by Dahlia Katz. While these four characters take centre stage, there is something haunting emanating through the eyes of Mertis’s knickknacks, an omnipresence that influences each character’s life and forces them to reckon with their demons. A china doll named Samantha, situated on the piano overlooking the action, holds a particular focus. From alarming disputes, to introspective chats about the universe over wine, and finally, the revelation of truths, nothing can be hidden from Samantha. Lighting and sound play a vital role in producing ominous and emotionally heightened moments (and John is chock full of them). Kevin Lamott infuses a darkened stage with red side lighting to set a sinister tone for one particularly disquieting encounter between Jenny and Elias. The menacing glow makes all the (supposedly) inanimate objects appear as if they are aggravated at the events unfolding. The consistent drone of opera and instrumental music makes for an eerie backdrop—Michael Laird’s soundscape will make the hairs on your arms stand on end. 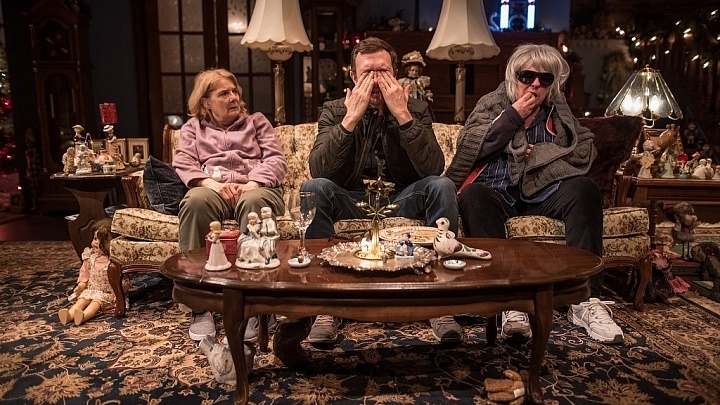 The chaotic and, at times, claustrophobic nature of the set (Shannon Lea Doyle) and other design elements reflect the disorder in Elias and Jenny’s relationship and Mertis’s internal struggle to cope with her husband’s illness. As costume designer, Doyle creates a contemporary look for each character, but through costume the audience witnesses the subtle and gradual dismantling of decorum. In one scene, Mertis sports a relaxed, clean look in a blue sweater vest, white blouse, trousers, and a fanny pack, but after a night in with Jenny and Genevieve, Mertis is tempted by old vices. When she comes in the next morning late to serve breakfast, her hair and costume are in disarray, suggesting her night did not go as planned. 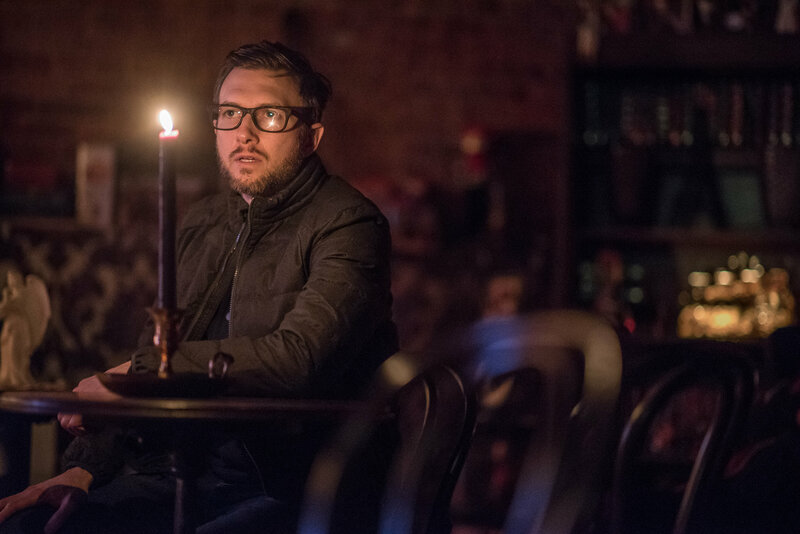 In addition to the four complex and emotionally troubled central characters, Baker turns loneliness into a character all its own, watching over and influencing these troubled souls. As performed by Yu, Jenny’s monologue in the second act is an emotional and eloquent recollection of a time she experienced an intimate connection with something bigger than herself (induced by minor drug use)—she recalls feeling the universe surrounding and holding her, and in that moment she felt an intense loneliness, but didn’t feel alone. 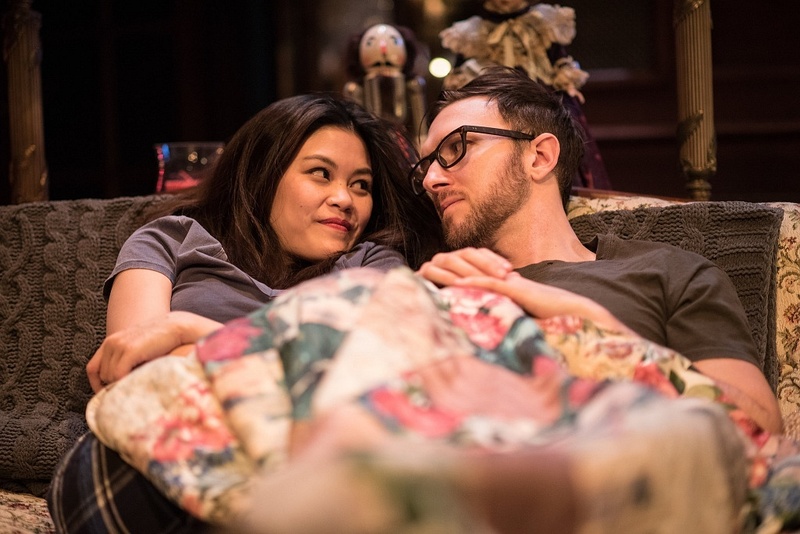 Until this moment, the audience hasn’t seen this vulnerable and deeply sad side to Jenny; Yu brings unhindered honesty to her character that captures the audience’s heartstrings. With Elias, Baker initially paints a picture of a self-absorbed and unforgiving prick, only to turn these perceptions on their heads in the second act when he discusses a dark memory from his childhood. While playing the character’s unlikeable characteristics for most of Act 1, Riccio also executes subtle physical tics and reactions that suggest a subtler, more complex internal monologue. Through situations of heartbreak, solitude, and dealing with mortality, Baker does not tread lightly in her writing, and it is clear that Goad has spent a copious amount of time delving deep into the material with his actors. While in the first two acts tensions between the characters and their environment climb rapidly, this buildup comes to a screeching (and disappointing) halt in the final act. While many of the little mysteries and nuances of the story, such as the condition of Mertis’s husband or her mysterious notebook written in a foreign language, are left ambiguous, the tipping point in Elias’s and Jenny’s seemingly never-ending toxic argument fizzles when it is revealed what Jenny has been hiding this whole trip. There are so many intriguing and mysterious loose ends left untied that the first and second act had me wanting more (astonishing, considering it’s a three-hour-long play). To then reveal this elephant that’s been in the room the whole show left me crushed and wishing that the playwright could have left this one last shred of mystery to hold on to. The Company Theatre’s production of John is an emotional and psychogical uphill battle that will leave you breathless. The harsh realities and themes confront audiences with the familiar, faceless presence of loneliness, along with the eyes of thousands of inanimate objects… or are they?